Mathieu Flamini and Alexander Hleb have gone, Emmanuel Adebayor seems to want to follow them, but the departure from Ashburton Grove that may well sadden Arsenal fans more is that of Gilberto Silva. Like the player himself, his transfer to Panathinaikos was low-key and conducted cleanly and without fanfare or acrimony. The Brazilian World Cup winner gave Arsenal excellent, often unsung service for six seasons, and his experience will be missed at the Emirates Stadium. But what can Pana fans expect from the boy from Brazil who has swapped London for Athens at the age of 31 after being offered a lucrative new contract by the Greek side? 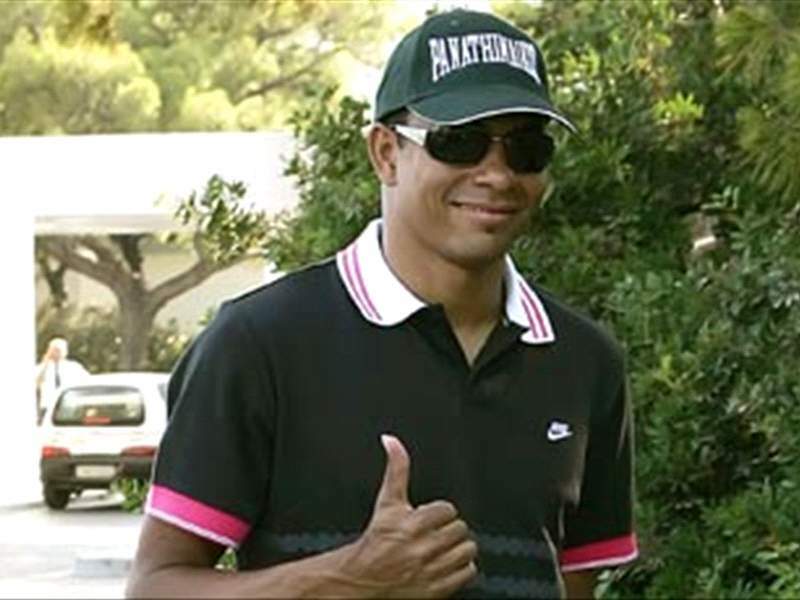 Gilberto Aparecido da Silva was born on October 7th, 1976, in Lagoa da Prata, Minas Gerais, Brazil. He was the eldest of four children, and grew up with his three younger sisters in a house in Usina Luciânia built by his father, a blacksmith. His mother was poorly and the family was anything but well-off, so although Gilberto showed promise as a footballer, playing in the street with friends and later joining local side América Mineiro as a youth player, he had to quit the game in order to work at a variety of labouring jobs, including carpentry and shifts at the local sweet factory where his hours were sometimes four in the morning until 10 at night. He joined the academy of his local team - but only for a few months as, at 18, he had to return to the sweet factory to help out the family for £120 a month. However, with the family’s fortunes stabilising a little, Gilberto was persuaded by friends to resurrect his dream in 1997 with América Mineiro, now as a full-time professional playing in central defence. In his first season he helped them win the Serie B division and promotion to Serie A. But América were relegated back to the second tier in 1999, and a year later, at the age of 24, he joined rival club Atlético Mineiro. His first campaign with Atlético saw him suffer a fractured right leg, but after recovering from that set-back, Gilberto was switched by manager Carlos Alberto Parreira from a central defender to a defensive midfielder, from which position he began really to make a name for himself. In October 2001, Gilberto was called up for the Brazilian national team by Luiz Felipe Scolari for Brazil’s World Cup qualifiers, making his international debut against Chile as a substitute. A month later (November 7th) he made his first start for his country, against Bolivia. Nevertheless, his inclusion in Scolari’s squad for the 2002 World Cup was something of a surprise: he was seen as cover for captain Emerson in South Korea-Japan. But when Emerson was injured in training immediately prior to Brazil’s opening group game, Gilberto was given the nod. He went on to play every minute of every one of Brazil’s games in the tournament, which they eventually won, beating Germany 2-0 in the final. His displays saw Gilberto hailed as one of the world’s best defensive midfielders. Arsene Wenger had followed Gilberto’s performances with admiration, and in August 2002, Arsenal signed him for £4.5million. Wenger said: "What I like was the fact that he kept things simple. He can play all across the midfield but the holding role just in front of the defence is what he does best." The Brazilian made an immediate impact for the Gunners, coming on as a substitute in the Community Shield against Liverpool and scoring the decisive goal in a 1-0 win at the Millennium Stadium. A few weeks later, he set a Champions League record by scoring the fastest goal in the competition to that point - just 20.07 seconds into Arsenal's 4-0 win over PSV in Eindhoven. He was also on target at Auxerre the following week. However, it was not as a goalscorer that Gilberto had been signed, but as a defensive central midfielder, a partner in the middle of the park for captain Patrick Vieira. And in that role, the man nicknamed "volante" (“the invisible wall”) in Brazil for his ability to protect the back four, set about breaking up attacks unfussily and almost unseen, then playing short, simple passes to launch counter-offensives. He was less easy on the eye than Sylvinho and Edu, fellow Brazilians who had preceded him at Highbury, and some of the Arsenal crowd were underwhelmed; but Arsenal finished runners-up in the Premier League and won the FA Cup in Gilberto’s first season as a Gunner. In his second season he was a key if unsung member of the ‘Invincibles’ who won the League again - this time without losing a single match. Gilberto played in 32 of those 38 unbeaten games. Yet some were still not won over by his consistent ability to do the straightforward things effectively and provide a platform on which the flair players could perform. But they began to change their tune early in 2004-05. During the opening games of that season, he started to experience recurrent pain in his back, and after Arsenal’s home game against Bolton on September 27th, he was diagnosed with a fractured vertebra following a scan. With Gilberto sidelined in a brace for most of that campaign, his value to the side became glaringly apparent. It was a classic case of not missing your water till the well runs dry: Arsenal suddenly looked a lot less solid defensively without their protective, ball-winning shield. Back in Brazil to rehabilitate, there were times when he feared he would never play football again; but happily he made a full recovery, returning to the first-team for Arsenal's 4-1 win over Norwich City on April 22nd, 2005, and keeping his place until the end of the season as the Gunners again finished as runners-up in the League and won the FA Cup. That summer - during which Gilberto won a Confederations Cup winners’ medal with Brazil - Patrick Vieira left Arsenal. Gilberto was now one of the club’s senior professionals, and a mentor in midfield for Cesc Fabregas. A few weeks after the 2005-06 season started, he extended his Arsenal contract to June 2009, and in October 2005 he was named captain for the first time, in a Champions League game against Sparta Prague. His defensive solidity later in that European campaign earned praise as the Gunners beat Real Madrid, Juventus and Villarreal to reach the final for the first time. In the Paris showpiece, the ten-man Gunners were beaten by Barcelona, but Gilberto’s disappointment was tempered by his selection in Parreira’s Brazil squad for the World Cup finals in Germany. He started two games and came on as a substitute in two more as the Seleção reached the quarter-final, where they lost 1-0 to France. Back with his club, Gilberto earned immortality in Arsenal’s history by scoring the club’s first competitive goal at their new Emirates Stadium home. He netted in the 84th minute of the Gunners’ opening League game against Aston Villa to rescue a point in a 1-1 draw on August 19th, 2006. He’d been named vice-captain to Thierry Henry in the summer, and with the Frenchman plagued by injuries in his final season as a Gunner, Gilberto got plenty of opportunities to lead the side - which he did with quiet authority. His goal against Villa proved to be a recurrent theme as he enjoyed his most productive season by far as a scorer, racking up 11 goals in all competitions. Only Robin van Persie and Henry scored more for Arsenal in 2006-07. And his form saw him selected for Brazil’s Copa America squad in the summer, when he was appointed captain in the absence of the injured Lucio. Ironically, Brazil’s triumph in that tournament (though Gilberto was suspended for the final) proved to be the beginning of the end of his Arsenal career. Given permission to return later than the rest of the squad because of his international exertions, Gilberto’s place was taken by Mathieu Flamini, and the Frenchman grasped the opportunity with both hands, forming a formidable partnership with Fabregas as Arsenal stormed to the top of the League and stayed there until March. Gilberto might have expected the club captaincy after Henry left for Barcelona, but Wenger handed the armband to William Gallas instead - not his most popular decision. A team leader confined to the bench, it was a difficult time for the Brazilian. However, he bore his fall from prominence with characteristic professionalism. Indeed, Gilberto will be remembered at Arsenal as a highly effective player on the pitch and a gentleman off it, someone who - perhaps because of the hardships he endured in his youth in Brazil - conducted himself with a degree of humility and class. He made a flurry of starting appearances towards the end of the 2007-08 campaign and scored his 24th and final Arsenal goal at home to Reading on April 19th, 2008. But although Flamini left for AC Milan as soon as the season ended, Gilberto decided to leave Arsenal after Wenger told him he could not guarantee him a place in the starting line-up next season. He was given permission by the club to travel to Greece to undergo a medical after they accepted a bid for him from Panathinaikos, whose new coach, Dutchman Henk Ten Cate, is a long-time admirer. At 31 he was offered a lucrative three-year contract by Pana, which few Arsenal fans will begrudge him. A complete team-player, his demeanour and professionalism were refreshing in a game too often disfigured by greed, self-centredness and overblown egos. He left the club as he’d entered it: quietly and without hype or controversy. He didn’t bleat to the media after losing the captaincy and his first-team place, despite his disappointment with the turn of events, and the contrast between Gilberto’s attitude in adversity and team-mate Jens Lehmann’s was stark. * According to the ProZone data analysis system used by football managers and quoted by the Sunday Times in January 2007, Gilberto Silva, Paul Scholes and Frank Lampard were among the few midfielders in England to attain "the elite Champions League level" of performance. * Gilberto is a patron of The Street League, a charity which organises football matches for homeless people, refugees and asylum seekers. In June 2003, Gilberto travelled to Brazil with 17 Street League players, the tour taking in a visit to his home town, Lagoa da Prata, and games against local shanty towns at the Maracana Stadium. * Gilberto plays the mandolin and the guitar, and used to perform at his local pub in St Albans in England. * He has a Giant Anteater named after him at London Zoo (Regent’s Park). Gilberto is an adoptee of the animal, which he received from a London Zoo competition winner. He described the native South American mammal as his “slightly more hairy brother." * Gilberto has said he may one day return to Brazil to play for Atlético Mineiro again. * He has also said that when he retires from playing, he would like to, "Live in a small farm and ride a horse and have all of my family next to me."